The background image on the cover is an excerpt from the “Nouvelle et Correcte Carte d’Afriquetirée des meilleuresautorités” created by Thomas Bowen in 1778. 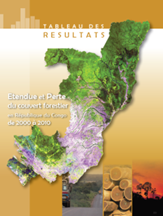 The CONGO FACET publication is the result of a study of forest cover and forest cover change in the Republic of Congo (RoC). The analysis made use of an automated "wall-to-wall" remote sensing method, developed jointly by South Dakota State University and the University of Maryland, and incorporated over 2,491 Landsat ETM+ images. The atlas consists of Landsat image composites coupled with classifications of forest cover and forest cover loss for the periods 2000-2005-2010. 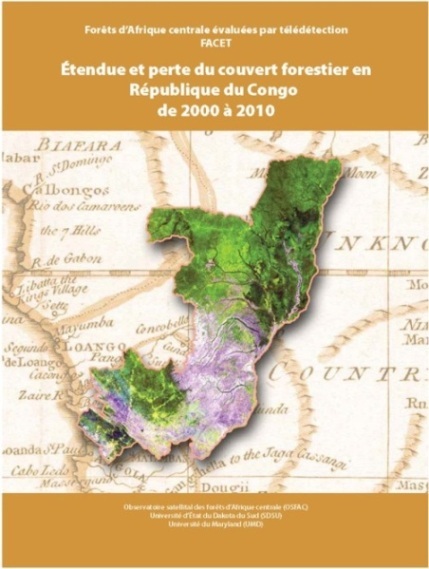 The Republic of Congo FACET Atlas and data are now available for download via: ftp://congo.iluci.org/FACET/ROC/. 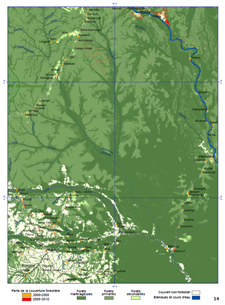 The FTP site contains the following files: the forest cover change image and two landsat image composites contain a readme file with data description and use instructions. A readme file is also here. If for any reason your not able to use the ftp directory, please contact us. Download and install winRAR (Windows) or the unarchiver (Mac) from the same FTP folder (ftp://congo.iluci.org/FACET/ROC/) or download the tools from the following websites. Windows: http://www.win-rar.com/download.html, and Mac: http://wakaba.c3.cx/s/apps/unarchiver.html. The table of results and the atlas were both combined in one document. This table of results was written by OSFAC team for a better understanding of FACET atlas. It is a summary of statistical results produced from the FACET atlas. These results (in ha or thousands of ha) were automatically deducted using the tool “Tabulate Area” of “ArcGIS” software. It was followed by treatment on Excel to the end of getting the various statistical tables. A multitude of information and statistics could be drawn from FACET publication. 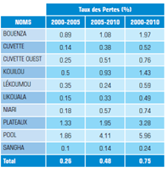 The examples relate to statistical results on the extent and loss of the forest cover in landscapes, protected areas, forest concessions, the departments and around major cities in the Republic of Congo. In total, between 2000 and 2010, the rate of deforestation in the RoC is around 0.75%, respectively 0.26% between 2000 and2005 and 0.48% between 2005 and 2010. 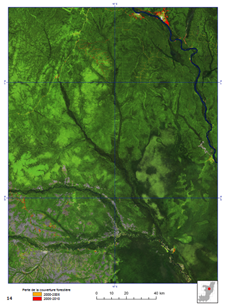 Monitoring the forests of Central Africa using remotely sensed data sets (FACET), 2012. Forest cover and forest cover loss in the Democratic Republic of Congo from 2000 to 2010. © OSFAC, 2012 Please let us know of any publications or formal use that you make of these data and products, and remember to reference the material according to the readme files.